Cookies, treats, chocolate…they are everywhere during the holiday season. If you want to stick to your health goals over the holidays but at the same time, not feel deprived, there are many options that are similar to our ‘old’ favourites that are worth a try. This cookie doesn’t have any refined sugar, trans fatty acids, colouring or other harmful ingredients that will sabotage your efforts to stay healthy. Give it a try and let us know what you think! Preheat oven to 325°. 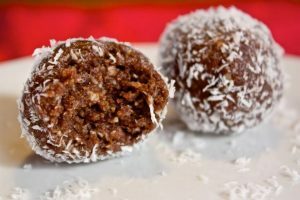 Melt the chocolate and coconut oil. While melting, whisk together flax seed and almond milk in a large bowl. When the chocolate is melted, remove from heat and pour into the flax seed mixture. Add the palm sugar and vanilla and beat well. In a small bowl, combine the rest of the dry ingredients, except the powdered palm sugar. Whisk well. Beat the dry ingredients into the wet ingredients until well combined. May need to add more flour to thicken. Form dough into small balls. Place the balls on parchment-lined cookie sheets and bake for 10 minutes. As soon as the cookies come out of the oven, roll them in the powdered palm sugar. Once completely cooled, roll them once more in the powdered palm sugar. Palm sugar is a nutrient-rich, low-glycemic crystalline sweetener that looks, tastes, dissolves and melts almost exactly like sugar, but it’s completely natural and unrefined. It’s acquired from the flowers growing high on coconut trees, which are opened to collect their liquid flower nectar. This nectar is then air-dried to form a crystalline sugar that’s naturally brown in color and naturally rich in a number of key vitamins, minerals and phytonutrients, including potassium, zinc, iron, and vitamins B1, B2, B3 and B6. It is never refined or bleached like white sugar. So the nutrients it was made with are still there. That’s rare for sweeteners, most of which are highly refined. Even stevia is highly refined in its white powder form (real stevia is a green herb).